^ Does that include the bus pass itself? Well this is good to see considering that it is going to be for St.Albert but essentially will be a part of a greater Edmonton region transit system. I was hoping that the LRT would go to downtown St. Albert. I think that is the eventual plan for LRT into St. Albert but unfortunately I don't think they feel they should bother planning that until they are way more certain that Edmonton will built the LRT that way. That's the eventual plan. Hopefully the province will come through with a regular, continuous funding plan for mass transit. It'd be great if the proposed SA line goes to the current transit centre there and maybe up to Mournville not far away. City of St Albert has a corridor protected in its last iteration of its transit master plan that was worked on the last year or so. This does require a few things to happen first... Ray Gibbon Drive needs to be twinned and completed to take some stress off of St Albert Trail before lane closures occur for LRT development. I'm relatively young and I'm skeptical if the LRT will be built into St Albert in my lifetime. I live in St Albert and commute to Downtown Edmonton. I'm glad that step one is going forward with the new Park N Ride facility going under construction this year. At the time I leave after dropping off the kids at day care, the current park n ride is out of spaces. A peak hours only bus service might be viable once the Edmonton Metro Region starts taking over transit for the region. Yes, the the SLRT can have a spur line off it to serve calmar and thorsby, and might as well continue on to Rocky Mountain House and Nordegg, maybe even Saskatchewan Crossing, with future service to Golden. Lets turn our LRT into Commuter rail or a street car, all at the same time, forgetting the proper purpose of LRT... and the great service the existing line has provided for 40 years nearly incident and problem free until we decided to expand it cheaply into expensive corridors. Totally agree that we need a bullet train to Calmar, Thorsby and of course, Carrot Creek. Just think about taking a 300 km/hr train from downtown Edmonton to enjoy the nightlife. Last edited by Edmonton PRT; 28-03-2018 at 11:19 AM. I've been to Mournville once back in the early 1990's. It seemed shorter to me for some reason LOL! Last edited by KC; 08-04-2018 at 06:17 PM. Indeed Andy Byford ^ used to be the TTC CEO, he's now running the MTA. He was in charge of a pretty large attitude and cultural shift at the TTC which is currently upgrading Line 1 to full ATC. The last update to the Design Guidelines was completed in 2011, referred to as the 2011 edition. This update reflects design issues and variances that were addressed during the construction phase of the NLRT extension to NAIT. I agree for the most part, although with the Campbell terminal I requested at-grade over elevated. After the west LRT portion of the Valley-Line, expect this to be the next line u/c. That said, there likely will be 1 or 2 stops constructed in a phase 1 to connect the former airport lands and potentially to get across the CN tracks. I hope they figure out a good spot for the Batchford Station. As well as well programmed and adjacent zoning. For the desnsity to be on site I thought a station between NAIT and "North" was planned? I had a great conversation about Hanger 11 the other night. This fellow is investigating a follow up story about how the CIA was in a covert operation at the Muni during the Second World War. Something about selling bombers to Thailand? I can't recall the guy's name. Paul, Peter something? Anyone know what I'm referring to? Did I even hear that right? All I had was a cup of coffee. Last edited by envaneo; 13-09-2018 at 01:23 PM. Love it! And it could never have existed with the Muni there. Maybe we could mount some old fighter jets or bush planes at the top of each tower, as a Blatchford Field remembrance? Looks like the Vancouver SkyBridge. Which is a nice landmark. Good to see movement. Similar in design to the Valley line bridge over the river. Great video at the bottom of the page in the link above. Illustrates the entire system from Blatchford to Campbell road. We better get funding for this asap. Last edited by envaneo; 13-09-2018 at 04:13 PM. I really hope that Council prioritizes this right after Valley Line West. This seems like a much better value proposition than the extension to Heritage Valley. ^ Or Centre line even if its just along Whyte Ave. I think you'll find that the extension to Heritage Valley will be done in the same phase as the extension beyond NAIT.... these routes are already approved, and have the planning done. Centre LRT is a long ways out, and not approved at all yet. And after the system redesign hopefully eliminates bus convoys, maybe the bus service will be regular enough to eliminate the need for Centre LRT. Both lines are more important then Centre. Getting the Province to give up its land For Heritage Valley might be a bit of a snag unless its already been approved. I agree that the Walker bridge over the Yellowhead is something the City of Edmonton could do immediately once the issues with Thales has been ironed out. Earthworks are well under way on the Ellerslie park and ride site. Some serious tonka toys carving and shifting that whole area on the NW corner of Ellerslie Rd. and 127 St.
Also, earthwork on the 135 St. interchange is progressing. This line is learning from previous extensions with the strategic tunneling under major intersections, although the turn from Castle Downs to 153 Ave looks like a disaster in the making. It seems a pity that the route through Blatchford don't allow for an interchange to the via rail station, hopefully there at least is bus service in the future. I've mentioned this in the Yellowhead thread, but I really think a road interchange should be built in conjunction with the Walker bridge, to a connector road between 107 and 121 streets (close Yellowhead access to those two instead). Use the opportunity to fix the existing at-grade disasters at Kingsway and Nait. I'd rather they pay a bit more and fix it all at once. My major gripe with this is that I feel they should be using this opportunity to raise the LRT by kingsway/nait, have the train turn westbound to have a raised station in the kinsway parking lot, and then turn north again and continue northbound. It is a key opportunity to actually integrate a transit center/LRT station well with the mall. And if I recall correctly, Kingsway wasn't opposed to this anymore. Kingsway was opposed when we first built the line and now that it's done and paid for they changed their mind? Last edited by Vincent; 14-09-2018 at 06:02 PM. Why does one line have to wait for another line to be built. Can’t lines be built simultaneously or is there a shortage of contractors. Maybe if we could get the province to pay for all our LRT lines like what happened in Vancouver. This would solve a major issue I have with practically all of the LRT stations in Edmonton. None of them stop at a reasonable distance to shopping or they are designed to be obstacle paths (see Southgate) if one or both of the elevators are down if you can't do stairs. In fact, at Southgate if you really don't do stairs (I can do a few), there is an amazing detour you have to navigate with your wheelchair or baby carriage. If the Kingsway mall were to have something useful replacing the old Sears location (a Walmart would be ideal), it would be really handy. In Calgary, there were several stops where I could buy groceries next to the station and stay at street level. Oh I forgot about the 4 options at Glenrose/Kingsway. Are they still on the table? Looking at the Display Boards, Administration is recommending grade separations at 137 Avenue and 127 Street. This represents modest progress. Why wouldn't there also be a grade separation at 142 Street since the LRT will have to tunnel under or elevate over the existing rail line at this location? Moreover, why keep the LRT at grade through Blatchford? There is an opportunity to build a cut and cover tunnel through Blatchford which can be done at the same time as installation of underground utilities. Finally, to save money, eliminate the "stops" at 145 Avenue and 137 Street where (unlike 132 Avenue) there is no possibility of integrating with ETS bus routes. The number of nearby residents likely to walk to an LRT stop is just too small to justify the cost of the stations. More stops also means slower travel times. 145 Ave and 137 Street would be "community stations" similar to Belgravia. Small, relatively cheap, and aimed at walkers. I think those kinds of stations are important. Wouldn't it be so frustrating to see LRT drive right by your house but you still have to get in your car to get to the nearest station? ^Light rail transit should be designed to move large numbers of people at fast speeds over long distances, not function like a local bus making frequent stops. I was disappointed to see that they aren't recommending grade separation at 142 St. 153 Ave to 142 St has become an important route for commuters and has removed a lot of traffic from 127 St. The line will have to go under the CN track anyway, they might as well keep it going under 142 St. Spoiler alert, selfish comment follows (ha-ha) East McCauley, I have to agree with Vincent regarding 137 St station. I'd be irritated if it got axed. Would mean a 15-20 minute walk to 127 St station for me. If I have to have the line behind my house and the effect that it has on traffic, I at least want to be able to have a community station that I can easily walk to. ^Our community league has for years been pushing to add a McCauley Station located between Stadium and Churchill Stations on the Capital Line. I am opposed to this for the same reasons. The volume of foot traffic from a surrounding low density residential area is not sufficient to warrant the infrastructure involved in adding a station. These low passenger volume stops also increase travel times and defeat the purpose of investing in what should be high speed rail based transit connecting major transit nodes. So people who live in higher density mature neighbourhoods close to downtown should not have easy access to mass transit in favor of people who choose to buy huge homes with 4 cars in the driveway, in golf communities outside of the AHD ring road that want the COE to spend a billion dollars on a lime they will use less on average than the formerly mentioned? ^No. You have got this wrong. The area where the McCauley Station is proposed to be located east of 95 Street is mostly low density residential and city utility yards. Should that change, the need for a station could be reconsidered. In the meantime, McCauley due to its central location has some of the best transit bus service in the city. If you are referencing the proposed Lewis Estates Station on the West LRT line, this is a major transit node that serves all of the rapidly growing neighbourhoods west of AHD. Even though I disagree with the system design for West LRT, there is no question that this station should be part of the overall LRT network. I ride the Capital line pretty much daily from Clareview to Central station and having a stop at McCauley, would slow Capital line down more then it already is. I'm not sure how long the Central District yard has been in its present location but when I was living in the area about 1979, I recall it being there. Is that where a proposed lrt stop would be? Speaking of Stadium station, there's lots of activity there lately. I'm not sure what's going on with the barricades there running up to the Legion and along the old Muttart/Brookfield development site was. Could be a service section of track? I hope the City of Edmonton realizes there's a pipeline buried about a foot away from track 1 even crossing 95th street by the bottle depot, beyond? Last edited by envaneo; 16-09-2018 at 03:48 PM. They're doing the infratucture alignments etc, so I would imagine they're prepping for the road to cross the track to commonwealth (stadium Rd). Thanks. Is it to connect Stadium road to 84th Street? I thought COE was abandoning that TOD there. Last edited by envaneo; 16-09-2018 at 04:25 PM. Also bit disappointing 153rd ave and castle downs road was recommended to be at grade. That one location should have been pushed below that intersection. This line comes so close of being "good" but couple of odd choices here and there which I seriously hope they iron out and reconsider. ^ Wow. Just imagine what $700 million more could do for Metro expansion. Ooops, did I say that out loud? Well thats something at least. So for 131 million how far will that get us? ^ Probably track laid through to Blatchford and a permanent station at Nail. The story says it's for extension into Blatchford. So with luck a permanent NAIT station and maybe land prepped for the north Blatchford station. I wonder how much the bridge over yellowhead and the rail yards would cost? Permanent NAIT should be the priority so we can run 5-car trains. Assuming equal contributions from the city and federal government that would be about $400 mil. So could we get two stations a bridge and maybe 1 more station north of the bridge? How many people want to bet that there will be a giant temporary gravel park and ride facility built in Blatchford? Wouldn't make much sense to build the bridge and not have a station on the far end. There's no room for a Park and ride at Blatcford unless the city wants to use the park across the tracks. Besides there's already a good size parkade right behind the hanger. Nait could always open that up/share it with LRT passengers. If the price is right they could make a bunch of extra money on game and concert nights at Rogers. In that case everyone wins. The City and Nait could even get creative and have some game night packages to use the parkade. All kinds of things going on. I wonder if the trailer park will still be there when the 127th avenue station is built? Well this is looking quite nice, I like the two below grade stations although I think despite some additional costs that there would be, I think they should consider one more below grade station at Castle Downs station. This would be nice if they could find a way to get this line built concurrently with the West LRT line. I hope the bridge across the CN yards gets approval. I was a bit surprised when the original plans for the southern extension didn't have a station at Twin Brooks. Last edited by Aaron_Lloyd; 23-01-2019 at 02:12 PM. And yet we are still stuck with surface line and station crossing by NAIT and Kingsway which is significantly busier. I'm sure at some point, theres going to be a lot of money fixing that mistake. But hey, C2E loves a measure once, cut twice rush job. Shovel ready go. both. Both cheered this on and saw some urban features, and were like ohh ahhh me likely.... while ignoring that transportation systems don't operate in a vacuum, and need to mesh well with each other... just ignore the multiple points of potential conflict at major crossings./... its urban friendly!!! but hey what do I know, I'm just an armchair cynic. Good enough for Edmonton though, amirite? We've been waiting for so long that we will take any poop they ram down our throats, because some poop is better than no poop I suppose? Can't wait to "I told you so" when the Valley line opens, like I have with this line, the SLRT, and our future mistake WLRT. I personally didn't really understand the economics or ridership #'s to back that station up. Oh well. Lot of stations in low density areas. Not a lot of connections with bus routes (yes, bus routes could be changed) I would save a lot of money by eliminating 132 ave, 145 ave, and 137 st. The existing Castle Downs Transit Centre is inconveniently on the other side of Castle Downs rd., and north a block and a half. They need to move it to where the the YMCA parking lot is. Last edited by K364; 23-01-2019 at 04:16 PM. It was proposed but the locals said they didn't want it. With the station in place, the bus can be replaced with a small route that just loops through the neighbourhood since the LRT would take them to the transit centre anyway. 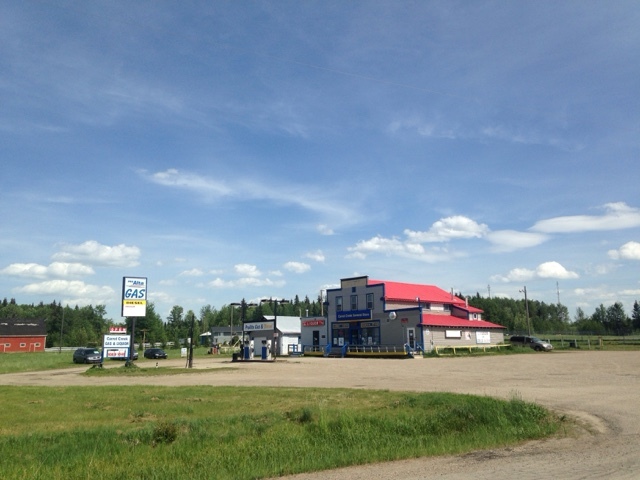 Twin Brooks is basically cut off from the area except for 111 street. A stop makes sense. I imagine it'll look quite similar to the Belgravia one. There's a real lost opportunity there by not running the line elevated between Kingsway mall and the curling rink. The city could have integrated a front door stop with the mall and created a crossing at 118th ave with none of the headaches we currently have. Yep, which was incredibly short-sighted of them. I wonder if the new proposed station near Ainlay / Confederation would be considered part of the south extension. I thought Kingsway eventually decided an integrated station would be nice after all, but were unwilling to front their share of the cost. I know the station at NAIT was supposed to be temporary, but that shouldn't include all the track leading up to it on 106 St.
Last edited by Foolworm; 24-01-2019 at 04:09 PM. Well if Kingsway could build a above grade station similar to wagner or wem it would be nice. What was supposed to be the Kingsway station ended up being at the RAH not NAIT. Blatchford has always been intended to have two stations. So unless you're advocating adding another station between 111 ave and 118 ave, it's a non starter. "A new element of the design involves the possibility of building a second station at Kingsway Mall. Iveson said Oxford Properties, the mall's owners, were not open to running track through their land five years ago, but that's changed now." If one additional station at Kingsway and a elevated track over Princess Elizabeth ave can be built while the other construction is being done we could have a much more efficient NLRT line. 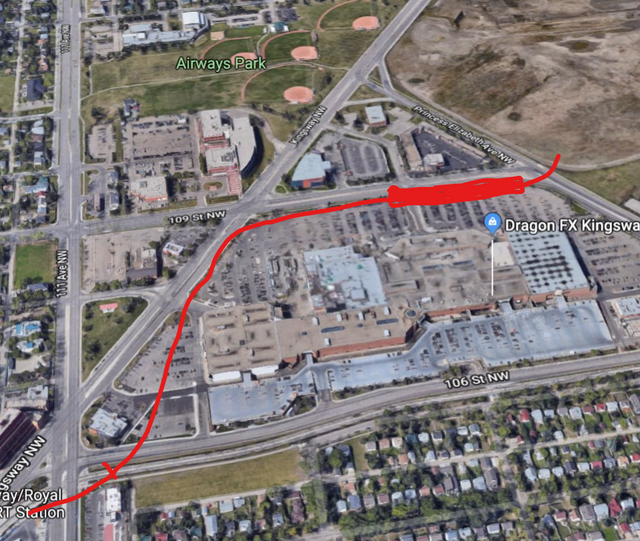 They could build the Kingsway mall station and all the track leading to that station leaving just the tie in to last to limit the time between closing the current temporary NAIT station and the new Kingsway station. While that is happening they could just build the new track that would lead directly to the future permanent NAIT station. If you can convince Kingsway Mall to pay the total cost of this elevated station, due to the fact that they had their chance in the past, then I'll agree with you. Seeing as a station at the mall would be primarily for their benefit, they should be willing to pick up the cost. This was a rough sketch was made awhile ago. The elevated track portion begins with red| across the street by Moxies remains elevated to across the street from the Best Western in a Wagner station esq concept. Yup. The option I would explore is elevating along the fields just south of Royal Alexandra. Most defiantly. The other part of this scheme to make it happen is to appropriate/in partnership with Moxie/Oxford and move Moxie's slightly to the North to the 10628 Kingsway NW parking. This is just for information purposes though, just musing about The elevation ramp could start where the red x is. In order for a ramp to clear 111 ave you'd have to start it on the south side of Kingsway. Which means you'd have to start it well back to clear Kingsway as well. The LRT is limited in the grade it can climb. Look at this image for the Vally line bridge over Argyle. The bridge structure is marked in orange. Notice how far back from Argyle it starts. Last edited by kkozoriz; 26-01-2019 at 09:06 PM.